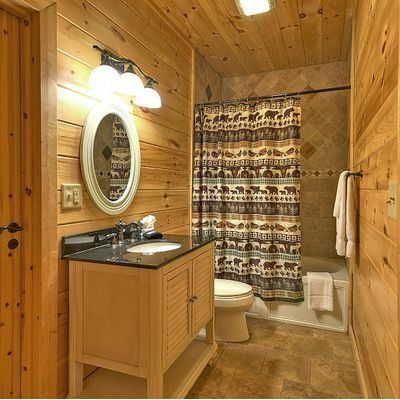 Cabin shower curtains, coordinated with your master bedroom, can give your log home, rustic timber frame lodge, or your post & beam lodge a needed, but simple face lift . It’s the little things that count—the details and home décor accessories that make your home special and unique. And outfitting your bathroom is no exception. Finding just the right designer shower curtains can make all the difference in your decorating scheme. While it’s important to have a decorating theme for your home, your bathroom can be a different theme from the other rooms in your house. For example, many people choose beach or water themes for the bath, even though the rest of their home is centered around a western theme or a nature theme. 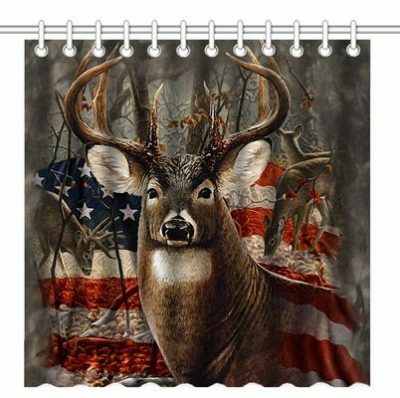 You decide—fabric shower curtain, vinyl shower curtain, luxury shower curtain or casual shower curtain. It’s your bathroom and your choice! Whether you choose black bear bathroom accessories or other bear furnishings, they will go well with any rustic home décor. Bear bathroom accessories come in two basic types: realistic bears that look like they could growl at you, and whimsical black bears that just look like they would like to play and have fun. 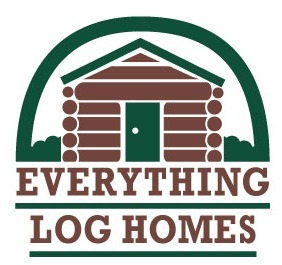 Both can work well in a country log or timber home. However, you shouldn’t mix and match the two, as you want to follow a theme. And that theme should reflect either natural and realistic wildlife beauty, or the fun and frolics of animated black bears. Your shower curtain will be the focal point of your bath, so choose it carefully. The bear curtain will set the tone for the rest of the room. 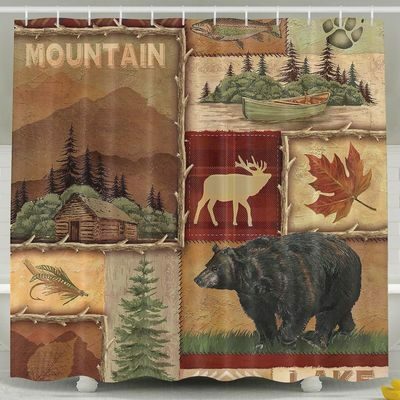 Choose your shower curtain first, then choose bear bathroom accessories that will complement your curtain and the rest of your bath wildlife or bear décor! Even just a few accent items will help to make your bath feel special. Country home décor can go in a number of directions. And you can mix and match themes with wildlife or rustic décor and still get a great result! For example, many people use a pinecone rug and curtains with wildlife rugs and wall decorations. And, in addition, you don’t have to stick with one kind of wild animal. You can use moose, deer elk, fox or bears—all in the same room. And they all work well together! Perhaps more important than the kind of animal you choose, is the color scheme. If you use muted colors in a room, you’ll probably want to stay away from vivid primary colors and pastels. And also keep in mind the style of the piece. If you use a bear rug bath mat with realistic bears in a room, you would not use a whimsical cartoon bear shower curtain. Keep the theme of your room on track, and keep the styles similar, and you will end up with a wildlife bath that will be extraordinary! Wolf Legends and Pups In Your Bath! Many of us have fallen in love with wolf legends and stories about wolf packs and their pups. Because of Native American folklore, those interesting legends have been passed down and preserved for us. And, fortunately, there are now interesting wolf décor pieces that you can use in your home. Even if your main décor theme is the broader “wildlife theme”, there is a place for wolves. 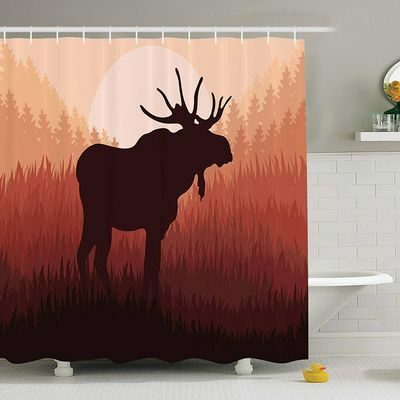 And using a wolf shower curtain with a wolf or its pack howling at the moon or a mother wolf with her wolf pups, can bring those ancient wolf legends alive—in your home! Cowboy and Western Décor in the Bath! Western décor is very popular, and there are many things that you can do to make your home cozy, with a feeling of being in the West or Southwest. Using a Western theme in the bath is one of them. Cowboys, cowgirls, horses and cattle all help to make your western décor rich and authentic. Central to your decorating scheme is your shower curtain. It is the largest single furnishing in the bath, and, as such, it will be the one thing that EVERYONE will notice! 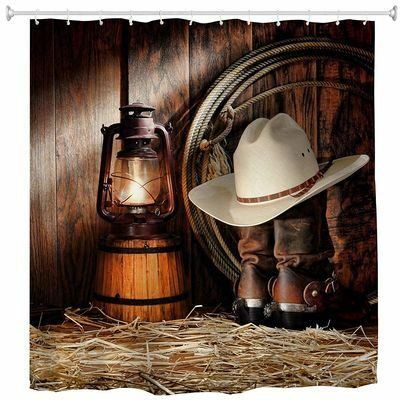 Choose a cowboy shower curtain with cowboys or cowgirls and other western motifs that you like. Your cowboys can be realistic or they can be stylized. And the colors in your curtain can be muted or vivid. You can also include cacti, horses, cattle, a ranch or Native American designs. Your bathroom is a place of refuge. A place where you can relax and unwind—even soak in the tub with soft aromatic candles burning—and your favorite drink in your hand. Make your cowboy bath a pleasant place for you! 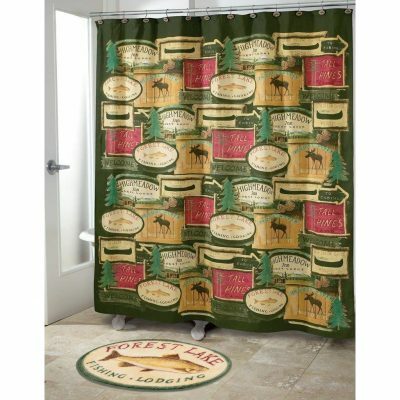 Western shower curtains represent unique shower curtains and designer patterns that will enhance your Western, horse or cowboy décor. Don’t just dream about cowboys and horses—live the dream! Adorn your home with Western décor and furnishings and make each and every day an adventure. Unique shower curtains can be the central attraction in your bath, just as a special accent rug can be the eye catcher in other rooms. Bringing the Wild West into your timber home or lodge is great fun—for kids and adults alike! Don’t overlook how important your bathroom is. After all, we all spend time each day taking a bath or shower—why not enjoy that time—exploring the West! 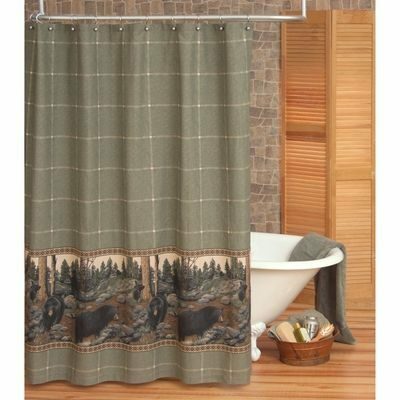 Include a western shower curtain in your western bath decor. 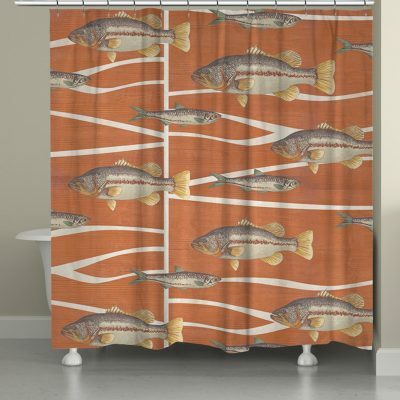 Choosing a fish shower curtain is just one option for your beach decor. You might like a tropical shower curtain, with palm trees and bright vivid colors that reflect the colors of tropical flowers and tropical fish. 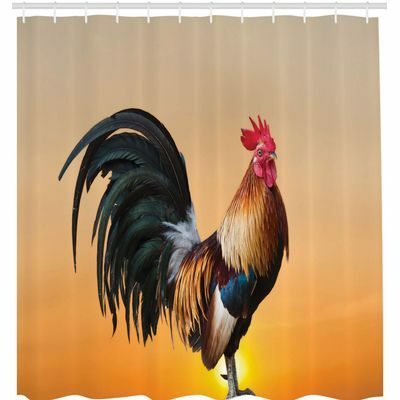 Or perhaps you prefer a beach shower curtain. It might have beach umbrellas, flip flops and sandy beaches, in addition to pictures of fish in the sea. On the other hand, you might prefer a strictly nautical décor, with a nautical shower curtain that has crisp blue colors and colorful ocean fish. A Fish is not just a Fish! As you can see, a fish is not always just a fish. If you want to use fish in your décor, you still need to further define exactly what kind of décor you would like. After you decide, the rest is easy. You simply find bath accessories that will complement your shower curtain and find accents for your theme. This simple process will work for you, no matter what kind of home you have—a contemporary timber frame beach house, a cozy seaside cottage, or a fishing lodge by a lake! Whether you live in a secluded log cabin in the woods, or a contemporary timber frame home by the sea, a lighthouse bath can be complementary to your other home furnishings. Lighthouses are very popular in home decor, for several reasons. First, they are beautiful, standing out on the water. Many people love (and collect) lighthouses simply because of their beauty! Second, lighthouses are a symbol of safety and security. They guide ships and boats into a harbor, and they warn ships of dangerous shoals and rocks under the water. They protect us from danger. Lighthouses are also a beacon of hope, and they have become symbolic of hope. They have religious undertones, as they represent the hope given to us by Christ. 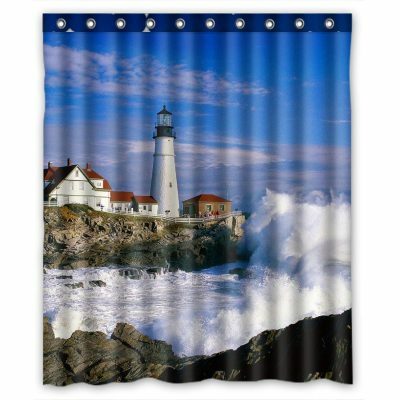 So, no matter where you live, if you happen to be one of the many people who love lighthouses, why not consider outfitting your bath with a beautiful lighthouse shower curtain and lighthouse accessories? Waterfront decorating can be lots of fun! And there are many high quality nautical home décor furnishings on the market. Colors – Nautical home décor furnishings are often patterned after traditional ships and boats. You often see colors like navy, white and blues like the ocean. Motifs – And the motifs used in nautical décor also reflect classic ships and their quarters. You may see anchors, helms (the ship’s wheel or steering wheel), fish and star fish, seashells, ships, boats or sailboats, lighthouses and even old salty sailors (or pirates). Fabrics – Fabrics used in nautical décor have clean patterns. You may see plain fabric with appliqued motifs or clean navy (or blue) and white stripes. And no lacy frills or ruffles for a classic nautical décor in your beach home. Since the nautical shower curtain in your beach cottage bath is the largest and most prominent feature of your bathroom, choose a beach shower curtain that you really like. And then build the rest of the room around it. Select colors that blend with the shower curtain and motifs that reflect its theme to give your bath the look that you want! So, if you are decorating a cabin by the shore and you want to use a nautical décor, keep your fabrics and patterns simple, your lines clean, your colors ocean-like and your motifs should reflect the ocean, its ships and boats and its sea creatures! Do you decorate your bathroom for the holidays? 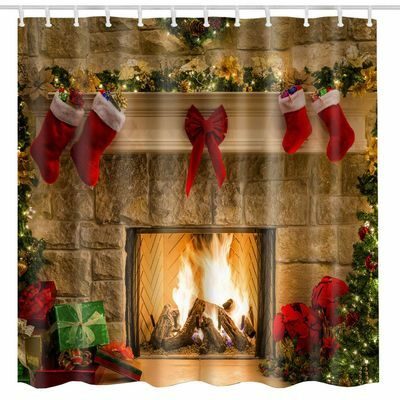 A Christmas shower curtain can bring the holiday spirit to your bath, bringing fun and joy to your family and welcoming your special guests. You spend countless hours decorating your home, so that you will be ready for the holiday season. Why not take it just one step further and bring your cheery holiday spirit to the bathroom? You and your family spend a fair amount of time there each day. Holiday decorations will brighten your day and help you get started on the right foot each day, during this busy season! Each year we look forward to decorating the house for the holidays. We enjoy the special Christmas décor (often traditional since we were children), making and eating special holiday foods, and giving gifts to those we love. Even something as simple as a holiday shower curtain can become part of those beloved traditions. After all, the shower curtain sets the stage for the rest of your bathroom. Choose your Christmas shower curtain to reflect your style of Christmas décor. If you enjoy whimsical Santas and teddy bears, look for a shower curtain that will go with your decorations in other rooms. Or, if you prefer a more elegant and sophisticated look, why not consider one of the Lenox series? On the other hand, if you like to change the mood of your decorating each year, consider purchasing an inexpensive shower curtain each year—so that you’ll have variety and fresh decorations each year for your family and friends. A snowman shower curtain is a great way to prolong the holiday fun, and it can be used all winter, as opposed to a holiday or Christmas shower curtain, which has a limited season. And you don’t have to have children in the house to enjoy snowmen—young and old love the snow, and snowmen bring back fond memories of our youth!